Conor McGregor was already a pain to deal with before he got paid handsomely to fight Floyd Mayweather last year. And it has only gotten worse as he has yet to return to the Octagon. 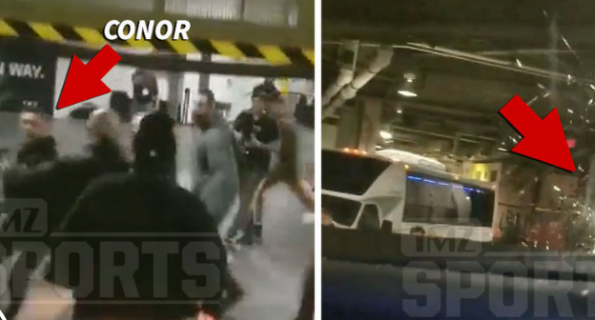 That probably won’t be happening for a while after the former UFC Champ and his entourage went crazy at the Barclays Center, attacking a bus leaving the arena with several UFC fighters in it, including Khabib Nurmagomedov. “An object was thrown through one of the bus windows — and the damage left one fighter, UFC lightweight contender Michael Chiesa, cut up and bloodied. Unclear who was responsible for shattering the side window but it’s clear people on the bus suspect it’s Conor. A member of Conor’s entourage then grabbed a chair and threw it at the front windshield of the bus. Conor grabbed a chair and tried to attack as well, but was restrained. Fighters were at the arena doing media ahead of UFC 223 … and McGregor was videotaped by several witnesses running around the arena before the incident. Dana White reportedly said, “Conor is in jail, he’s done,” according to MMA journalist, Jim Edwards.